When you’re ready to choose the perfect flooring to suit your existing décor, budget, and personal style, get in touch with our friendly and knowledgeable staff. We’re always ready to discuss your project and help you find the best floors for your home or business. Waterproof vinyl flooring, carpeting, and other materials are excellent choices for any room in a home or business due to their durability and water resistance. In addition to these qualities, waterproof flooring is attractive, affordable, and available in a wide array of styles and colors. No matter what your interior style or existing décor is like, there’s sure to be a type of waterproof flooring to suit your needs. Waterproof vinyl flooring is capable of mimicking many natural materials due to the 3-D printing process used to manufacture it. 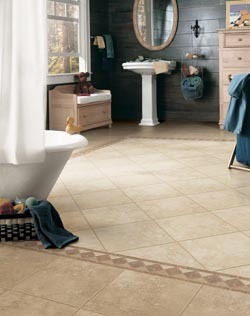 Whether you prefer the look and feel of stone, wood, ceramic, or porcelain, vinyl flooring is able to recreate it. In addition, vinyl is easy to maintain, lightweight, and long-lasting. The best way to make sure your new waterproof floors stay in good shape is to schedule waterproof flooring installation with a skilled contractor. A qualified installer is able to remove your old flooring and install your new investment properly so that water cannot penetrate the floors and damage the subfloor. Make sure your new floors look gorgeous for many years to come by scheduling installation with an expert. Contact us to peruse our wide range of waterproof vinyl flooring and carpet. We’re proud to serve clients in Webster, Texas, as well as the surrounding areas.